The Tuesday session comes nearly two weeks after Mayor Nick Isgro claimed councilors were working quietly behind the scenes to increase the tax rate by 13 percent. WATERVILLE — The City Council on Tuesday plans to discuss budget revenue, capital improvements, debt service and Kennebec Valley Community Action Program transportation service at the council’s budget workshop. The meeting is scheduled for 7 p.m. in the council chamber on the third floor of The Center at 93 Main St. downtown. The council will consider a proposed $42.3 million municipal and school budget for 2018-19, which represents an increase over the current $39.9 million budget. The proposed school budget is $24 million and the proposed municipal budget is $18.3 million. If the budget were approved as is, the tax rate would increase from $23.30 per $1,000 worth of valuation to $26.30 per $1,000; but by all accounts, the budget probably will be less than what is proposed. The workshop comes nearly two weeks after Mayor Nick Isgro claimed councilors were working quietly behind the scenes to craft a budget that represents a 13 percent tax increase over the current budget and that the council had been using an effort to recall him from office as a distraction from work on the city budget. He said “political elites both on the city council and behind the scenes are colluding with political parties and special interest groups from outside Waterville” on the budget proposal and a tax increase. “They are all working to distract the public and the media from their budget scheme with their effort to remove me from office so I can’t veto it,” Isgro wrote. City Manager Michael Roy and Council Chairman Steve Soule, D-Ward 1, disputed those claims last week, saying Isgro’s statement was false — that the council was still in the workshop phase of the budget and no numbers had been decided. The proposed municipal budget at this point is Roy’s budget, meaning his recommendation, and councilors make the final decision on the budget. Councilors Winifred Tate, D-Ward 6, and Jackie Dupont, D-Ward 7, said after Isgro’s Facebook claim that they had not been working quietly on a budget proposal with a proposed 13 percent increase — that they had been attending budget workshops, which are open to the public, and listening to department proposals, and no budget decision had been made. 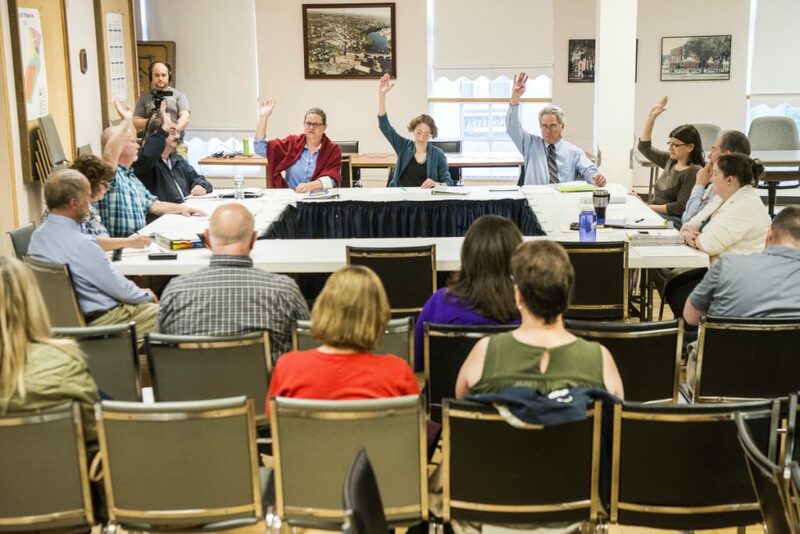 A budget summary workshop scheduled for May 29 is billed as the final budget workshop, but councilors have the authority to call additional budget workshops, according to Roy. The council could propose changes to the budget on May 29, he said. Right now, the council is scheduled to take a first vote on the proposed budget June 5 and a final vote June 19, but those dates could change if the council decides to schedule more budget workshops after May 29, Roy said Monday. Roy on Friday issued a snapshot of the city’s financial picture to councilors, intended to help them in the 2018-19 budget process. The main reason the proposal is so high is that the city is reducing use of “one time monies,” or surplus, according to Roy’s snapshot, which he notes is intended for discussion purposes. Last year the city used $1.8 millon of surplus money to help balance the budget, and this year officials are proposing to use $460,000 — a difference of $1.34 million, or $1.85 per $1,000 of assessed property value, it says. On the expenditure side, the city’s request — excluding schools — is $60,000 less than last year, according to Roy. He was referring to money the city received as part of ending its contract with the Penobscot Energy Recovery Co. — the former recipient of the city’s trash. Challenges the city faces include that at just under 14 square miles, it is the fifth-smallest city in Maine, and 29 percent of its land is tax-exempt, according to Roy. The city has one of the highest tax-exempt-to-land-area ratios in the state, he said. A service center, Roy said, faces financial pressures on a daily basis that other communities do not. Nonresidents come in and use city supported facilities such as the municipal pool, the airport, the opera house and other services without helping to pay for them, he said. They use city roads and may require fire, police and rescue services, he said. A “huge number of people” come into Waterville every day for services they need or enjoy but do not help to support the cost of the services, according to Roy. City government exists to provide services, and people must provide the services, he said. There are no other revenue sources the city can rely on, because the city has no control over revenue, he said. State revenue sharing, motor vehicle excise and education subsidies account for 75 percent of the revenue stream, and for many years, state revenue sharing was by far the city’s largest source of outside revenue coming in. The revenue sharing picture has changed dramatically over the past 12 years, according to Roy. The city’s surplus, or fund balance, has fallen from a high of $10 million about 10 years ago to a low of $5.45 million today, according to Roy. The city has a policy that the surplus be 12 percent of the previous year’s operating budget and the city’s current balance is below 12 percent. If the city stops using surplus, possibilities to generate more money include lobbying the Legislature to restore revenue sharing, doing everything possible to increase the tax base, continuing to find ways to be as efficient as possible in providing services and increasing the tax rate, according to Roy.